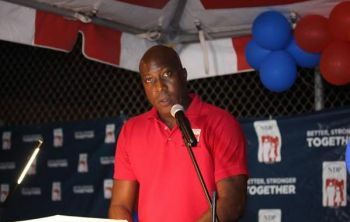 He gave his views while addressing a NDP January 18, 2019, rally held at the Sunny Caribee Parking lot, where it was the night for the four At-Large Candidates to address the Territory. He said it’s no secret, the Territory is experiencing some challenges with the Financial Services sector—brought on by a ever changing goal post in the international community. He had prefaced his arguments insisting that that Virgin Islanders need to lead the main industries in the territory. “It time for us to just do it,” Hon Walwyn said as he implored the people of the Territory, be ready to chart their own destiny leading the main industries domestically. He said that while the disasters of 2017 placed the people of the Territory in a very difficult position but they have also presented a distinct opportunity. With the large gathering strongly on his side, he added, “we cannot be afraid to engage in this new space, but we must do so with the people of the VI playing a major role in this industry, and significantly, with a government that believes so much in its people, that we are willing to invest in the infrastructure required for high speed internet." He said, “if we continue to leave something as important as the internet solely in the hands of private providers, to give our country affordable and easy access to the worldwide web, we stifle our very own long term goals for the Financial Services industry and any hope of benefiting from the economic substance requirement opportunitie.” True, internet services is poor but delivering fast, high quality internet services is not an inherently governmental function; the services can be provided satisfactorily as done elsewhere by the private sector. The government should not be competing with the private sector. What the government needs to do is establish policies, set standards, provide no nonsense oversight, rake poor performers over the coals, show poor performers the door......etc. Agree, the BVI must look for the silver lining in the dark Beneficial Registers and Economic Substance clouds. One of the core elements for turning the BVI creative, innovative, high tech society is education and training. We don’t need to reinvent the wheel; we just need to look at other successful locales and benchmark them, ie, Singapore comes to mind. Why would we think that the govt would deliver faster internet - every other service delivered by the Govt is hopeless! The Economic Substance law will destroy the revenue stream for the BVI Govt. Essentially it has been money for nothing for 25 years - and it has been frittered away on first class travel, 5 star hotels, pointless conferences, expensive vehicles, excessive rents for buildings that we don't need, corruption and most of all incompetence. Only a very few of the companies incorporated here have any intention of establish any economic substance in the BVI - and those that want to are struggling because the BVI does not have sufficient office space nor sufficient qualified staff. Economic substance requires qualified competent staff, not people who merely print out, file and scan documents. We need alternative sources of income for the Govt - fishing and farming are simply not going to cut it - we are going to have to free up land ownership and start letting foreign investment into land. ""He said, “if we continue to leave something as important as the internet solely in the hands of private providers, to give our country affordable and easy access to the worldwide web, we stifle our very own long term goals for the Financial Services industry and any hope of benefiting from the economic substance requirement opportunities,”" But we did not leave it solely in the hands of the private providers. We have being paying a regulator for years to ensure proper forward movement. What happened? This dude needs to just shut the f***up! His mind set on being a Dictator and ruling this Territory ain't going to work. What he needs to do is man up and give the people accountability. Sometimes one's Actions are more enbedded with their true Character. We want a Government for the People! Not People for Government! For years the current leader of the VIP party said to the NDP govt, tell the people the truth about what is coming, NDP didn't and now they are asking to be re-elected. You voted them out the first time they got in because they fail you and you allowed them back in, lets see if the people of the VI Is fool fool! Oh please Myron is on target what he saying is facts we in the offshore industry know it is a touchy subject and thus far Myron who want to be the next premier heen very vocal aint hear nothing from andrew concerning such important topic that shows that he is not paying attention to what is going on internationally. Instead he worrying about who had a full slate. You had your chance you have represented us poorly good bye.